FC Politehnica Iasi of the Romanian top flight have sourced themselves a new goalkeeper in the lofty guise of Jacob Samnik. The 18-year-old American is a product of the Kalonji Soccer Academy in Georgia, from whom Politehnica have landed him on a two-year contract. But as well as being a decent young keeper, Samnik is also notable for standing at 2.07 metres tall -- that's approximately 6-foot-8, an inch taller than Peter Crouch. It would take a heart of stone not to be moved by seeing Marius Matica pop the prematch question. The Romanian fourth division clash between CA Oradea and CS Diosig got off to an unorthodox start at the weekend when two of the match officials got engaged to one another. 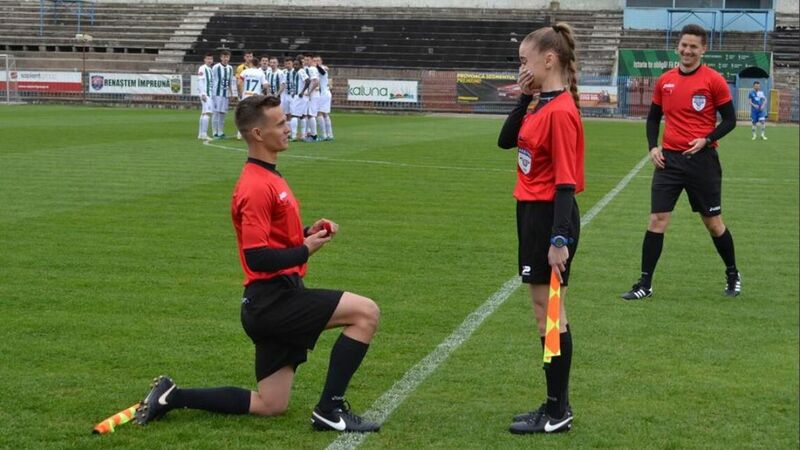 Assistant referee Marius Matica, 22, sprang a surprise proposal on girlfriend Gyorgi Duma, 20, as the two officials lined up for the pre-match formalities. The decision went to VAR but thankfully the call was eventually accepted by a shocked Duma as both sets of players and the fans in the stand applauded.